Finally A Pool Company That Will Stick! All of our technicians are required to take Pentair and Hayward education every year. This is on top of the IPSSA water chemistry test and CPO certification already required. As a company we gladly accept every new innovation in technology and especially those in the pool service industry. We are trained up on all the latest equipment in order to give our clients the best recommendations. This includes variable speed pumps, automation systems, app-enabled automation, pool solar, warranty and rebate information. We keep our clients in the know about any rebates for new equipment and SDG&E incentives for energy efficient upgrades. Energy efficient upgrades tend to have a high up-front cost but we give our clients a thorough idea of how much they can be saving with more efficient equipment. For example, a new variable speed pump typically pays itself off within 2 years of using it compared to a single speed pump. 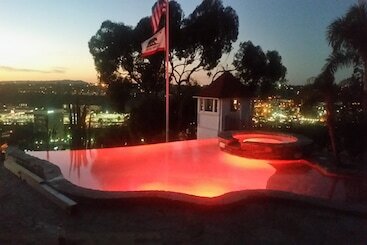 Here at La Mesa Pool Services we do everything in-ground pool and spa, Except build them! We won't be giving you the run around because we're trained on all kinds of pool service related issues. We do pool repair on all kinds of equipment, offer restoration services such as, acid washing, tile cleaning and green pool cleaning services. Deck-o-seal replacement, pump seals, heater repairs, you name the pool repair and we do it! Although, we wish we could meet all your pool and spa service related needs it is not feasible but we picked out the best of the service providers for the things we don't cover. If it is ever the case where we cannot provide a solution for our clients we don't let them go searching around for other service provider because we know that they can be hit or miss. We keep a list of our best referrals for all the services that we don't provide such as Greg with SunChaser Solar we use for pool solar repair and installs. Or Blue Moon Pool, who we use for pool construction, remodel or re-plastering. Lastly, we use Kaycee with White Sands Spa Repair for all above-ground portable spa repairs. ​Call, Text, Or Email NOW! ​Fill Out Our Form And Ask about Same-Day Service! Same-day Service Pool Service Spa Service Acid Washing Green Pool Clean-up Equipement Repair Equipement Replacement Tile Cleaning The Works! Is your swimming pool green? We can restore it back to new! Has your pool equipment been acting funny? Give us a call to come check it out. FOR FREE!!! Need a dependable pool cleaning service? Look no further with our affordable weekly service plan. All of our technicians are well trained and educated to handle any swimming pool equipment or messy situation. We also make sure all of your equipment is in proper working order or if they are out of date. We will give you honest feedback when it comes to this because we don’t want you wasting any money on unnecessary upgrades. 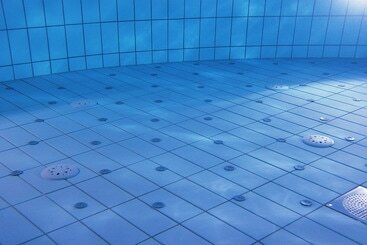 ​Over time, your pool tile begins to build calcium deposits, which takes away the shine your tile once had. Calcium build-up happens when your tile seal becomes brittle or if it was not sealed properly. The Calcium seems to come through the grout from the underlying surface. Our specialized equipment allows us to safely treat your tile, but unfortunately calcium build-up will happen again. This is because calcium build-up can also happen if the pH levels of your pool are too high. This is the white you see across the waterline of your pool. Periodic treatment to your tile will be needed to keep them looking like new. Simple mistakes most pool owners make can take years off their pool’s lifespan. 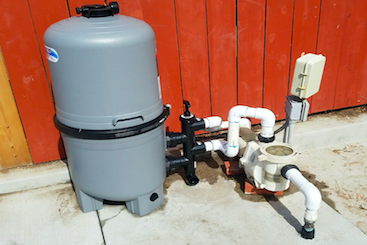 Of course basic wear and tear of some pool parts like your cartridge filter, grids, and motor will eventually need to be replaced, but properly maintaining your pool will increase your pool’s lifespan and will ultimately save you money. Here are some tips to help you not make these same mistakes and keep your pool in proper working condition. 1. How frequent is your pool being used. This is important for chemical balance and most pool owners who don’t have a service professional miss this simple concept. The more frequent you use your pool, the more chlorine it will need to keep the chemicals balanced. Most pool owners do not adjust their chemical balance with the frequency of pool usage, which is why most pools end up turning green even when the owner is trying to keep it clean. If you have a service technician, be sure to notify them when you are going to have more people over in the pool then usual so they can prepare your pool and add any additional chemicals as needs after the party. Having your lovable retriever join the family in some pool fun is always a great time, however, it is important to make sure your pool is properly cared for after Spot is done having fun. That means to net your swimming pool promptly after your pet has taken a dip. Also be sure to clean the skimmer basket and filter the next day to make sure no hair gets back into your pool. The last thing you want is a clogged impeller from all that dog hair. 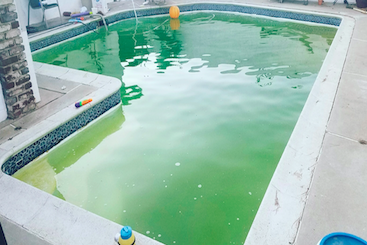 Most pool owners cut back on the times they run their pool pump to save some money on their electric bill, however, the money you’ll be saving on your electric bill will now go towards buying more chlorine, acid, and service maintenance for letting your pool turn green. When running your pool properly, your pool will keep itself clean by keep debris out of your filter and skimmer, which is the start of algae growth. Also remember that high temperatures can increase algae growth, so it’s important to keep your pump running during those hot summers to keep your pool blue. If you are having trouble with unwanted algae, we suggest you run your pool for 24 hours a day until your pool improves. 4. Improper use of pool filter with pool dye. Pool dye is a great and fun way to give your pool the right look you want for your next pool party. They are safe for your pool, however they can effect your pool filter if not applied correctly. It is important to remove your cartridge filter or grids and put your DE filter on recirculation before you add the dye. Run your filter as normal without your filter installed. Once the dye has cleared, replace your filter elements. Algaecides are used to treat different types of algae in your pool. Most of these products will significantly reduce the amount of chlorine levels. It’s important that you counteract by adding more than the usual amount of chlorine before you apply the algaecide treatment. Low levels of chlorine with a combination of algaecide can turn a green pool even greener. Be sure to follow the manufacture instructions and keep your pool pump running to allow the algaecide to integrate throughout the entire pool. Want to learn some DIY tips for pool cleaning? "My pool was in bad shape when these guys came in. They drained and acid washed it getting my pool looking better than it ever has since I bought the home. They also maintain the pool weekly and I've never had any complaint, my pool & spa are always ready to go."